Is it possible for an SUV to be green? Maybe so. For 2014 Nissan is unveiling the 2nd generation Rogue. The first generation Rogue was a very good seller for Nissan – only the Altima sold more – but it had its drawbacks, poor rear visibility comes to mind. 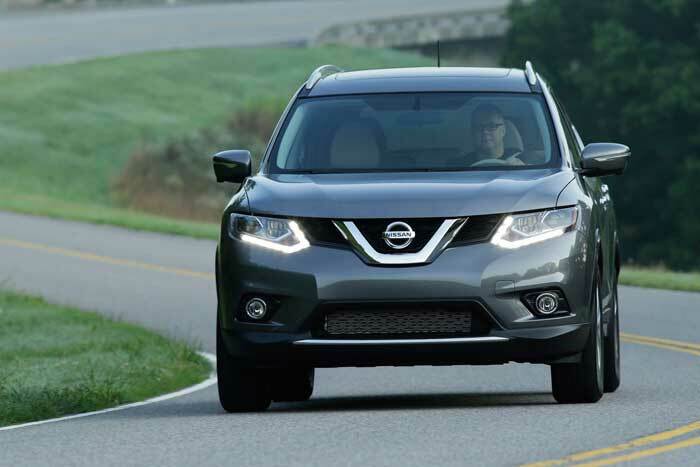 With the 2nd generation Rogue Nissan is improves upon the first generation while correcting a few issues. But just how green is it? For a start, Nissan has significantly improved the Rogue’s estimate miles per gallon. The projected fuel economy for the front-wheel Rogue is 33 mpg on the highway, an 18% improvement over the previous generation. Nissan also claims 26 miles per gallon in the city for a combined average of 28 miles per gallon – not bad for an SUV. Nissan hasn’t yet provided an estimate for the all-wheel drive Rogue, but it is a virtual certainty the mileage will be a couple of miles per gallon lower in the city and on the highway. The big news for the Rogue is the increase in interior space. The Rogue is actually an inch shorter than last year, but it packs a lot more interior space. Passenger volume has increased from 97.5 cubic feet to 105.8. There is even room for a 3rd row. It goes without saying the 3rd row seat will only be suitable for young children or very limber adults, but still it is seating for 7 passengers when you need it. 2014 Rogue Image Gallery – Click on the image above. As you might expect with an all new model, Nissan has also redesigned both the interior and the exterior. They feel the interior has a cleaner, more sophisticated look while the exterior is more areodynamic. Based on the images supplied by Nissan I am inclined to agree. In addition to the extra space, there are some nice new options, but they come at a price. The price for the Rogue SV (the version most people will buy) increases from $22,750 to $24,230 (a jump of $1480). For the extra dollars you get automatic dual zone climate control as standard, a Bluetooth hands-free phone system, and a telescoping steering wheel (the previous generation’s could only tilt). Also included as standard equipment is LED daytime running lights and LED maplights. All in addition to the improved MPG. Personally, I always see the arrival of a new generation of vehicle as a buying opportunity. Not to buy the new one, but to grab the old one at a substantial discount. Especially if the new model has already arrived on the dealers lot. It’s true that the new models usually have added features but the old models are tried and true. And, all though new models are built much better than they used to be, they still aren’t perfect and therefore may be prone to more problems than the outgoing model. Apparently Nissan agrees with me regarding the desirability of purchasing last year’s model because after I wrote this last paragraph I found out that Nissan will continue selling the old Rogue (renamed the Rogue Select) at a base price of less than $20,000. So is the new Rogue green? Well they have included PURE DRIVE badge on the Rogue stating it is and who can argue with that. All things considered, when it comes to a green SUV the Ford C-MAX may be a better choice, but it is smaller than the Rogue. if you need the extra space, and especially the 3rd row seating, the Rogue looks to be worth a look. It gets decent mileage and provides a lot of space for the dollar. So the real question may be, do you buy the new model or the old? 3rd row legroom (in.) 37.4 N.A. *MPG as estimated by Nissan USA.